There are certification examinations which are often given by many of the leading companies. These examinations are exceedingly helpful for those who are looking for leaps in their career. And such exams also increase your knowledge in the domain. Now these exams need the proper amount of preparation to crack. Various exam simulators provide the ideal examination environment through VCE files. VCE or Visual Cert-exam is a file extension. This was created as an exam emulator for certification examination preparation which is used commonly for IT certification examinations. This is pretty useful as you can create an examination environment at home or wherever you want to boost your exam preparations. To open the examination papers with VCE file extension, you need to have Visual Cert-exam Suite. It is not likely that the VCE Suite is present in all the devices that you use. So if you are carrying the preparation materials with you which is in VCE format and if you cannot open it because you don't have the VCE Suite with you, then you can always rely on VCE to PDF converter tools. Now files in PDF formats can be opened anywhere. PDF itself stands for Portable Document Format. PDFs, as the name suggests, are portable in the sense that they can be opened in any system, unlike many other formats which are not always supported on the powerful device. Since VCE files are not read by most of the E-book readers, VCE to PDF conversion is the best option. Note: - We've added one more tool to this list. 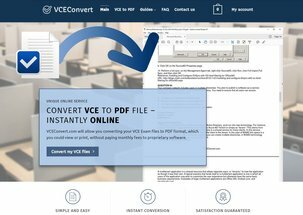 VCEConvert is an automated Online tool to provide VCE to PDF conversion. Its significant advantage is the speed which you can get your VCE files converted - which is, according to our tests - few minutes. As part of their service, your VCE file will be converted to 3 PDF files - Portrait, Landscape, and Questions Only, which you could download few minutes after uploading your file. This is done to get you ready for your upcoming exam. Latest VCE versions are supported, to make sure you'll get your PDF file - FAST. 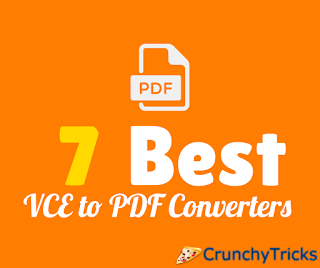 It's one of the easiest ways to convert files. This software can convert dozens of file formats, quickly & easily. It works perfectly with PDF, DOC, HTML, ODT, RTF, TXT, XLS, PPT, WPD, WPS, BMP, GIF, JPG, TIFF, MP3, WAV and more. Follow the steps mentioned below to convert any file from vce to PDF. Click here to download Convert any file. Simply download, install & open to use it. doPDF is an offline tool which helps you to create PDF files. With this, you can convert files in VCE formats to PDF files. First up, download doPDF. For the conversion, you must have the latest version of VCE Designer in your system. You can get it from here. Then the steps are pretty simple. Open the file you want to convert in the VCE Designer. Go to the Print option given in File. Then, in the printer option, select the printer as Do PDF. By choosing this, the VCE file would not be printed. Instead, the file will be converted into PDF. It will then be saved in a location. So you can open the PDF version of the archive that you have just converted. Convert VCE to PDF is an online tool with which you can create PDF files out of VCE formats. It supports conversion of even the latest version of VCE file formats. You can send the file that you want to convert by either uploading it or by pasting the link to the archive. Then, give your email address. After the payment and checkout, the converted file will be sent to the email address that you have provided. The conversion will be completed in 1 to 12 hours. It charges $3.99 per conversion. And there are attractive limited period offers such as getting the 2nd conversion free by only paying the charges of one conversion. Convert VCE to PDF is the fastest and cheapest source of conversion tools available online. This is a website that converts the VCE files into PDF formats for free. Upload the VCE file in popular cloud storage like Google Drive, One Drive, Box, etc. Then send the link to the archive. Within 12 to 24 hours, you will get a reply which will contain the converted VCE file in PDF format. There are PDF files of popular certification examinations. If you don’t find them, you can explicitly make a request, and it will be addressed immediately. The converted file will be downloaded into your device as a compressed zip file. So make sure that you have 7zip or WinRAR installed. This tool is useful when you have to convert only a limited number of records. This is an offline tool to convert VCE files. Download the tool to your device from here. Then, once it is installed, browse the VCE file and click on Convert. The PDF file will be converted within a few seconds. VCE2PDF is an online tool to convert VCE files into PDF. In this, you will have first to sign in and give your email id. Then you can upload the VCE file and get the PDF files of the exam sent to your email id, and the link will be posted on your account page. The Premium PDF costs $9.99. For questions only PDF, you can avail them at $1.99. In this website, you will also get the VCE files if you enter the code. CutePDF is also a PDF printer software just like Do PDF. Using the VCE Designer, you can convert the VCE file into PDF. Open the file you want in VCE Designer. Then print the document choosing the printer name as CutePDF. It will be saved in PDF format. You can download the tools or work on the online converters to get your task done. If you have to convert files regularly, many of the online tools have attractive offers for modest prices. So choose the best one that fits you and enhances your preparations for exams.